In 2010, ACE mascot, Ace Clean, teamed up with Ironman to provide 30,000 disease prevention focused text book covers to New York City students. Ace Clean and Ironman were seen in Times Square promoting handwashing and healthy hygiene while the Ace Clean cartoon video played on the Nasdaq board in the square. 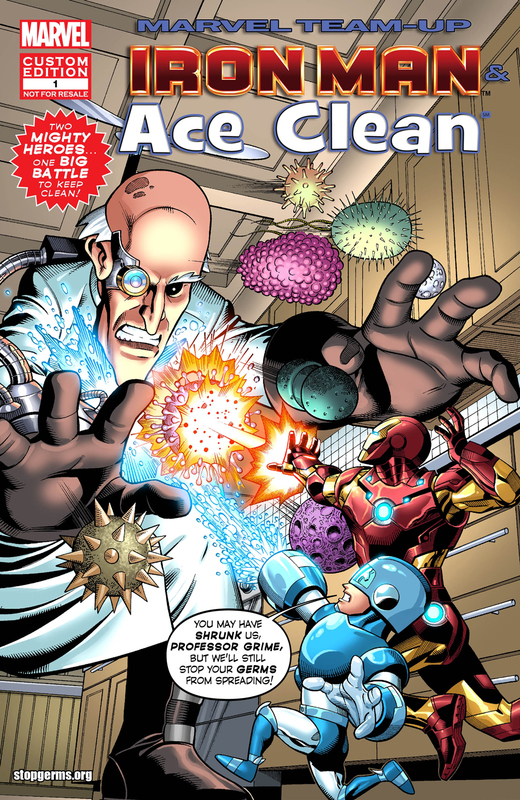 In 2012, Ironman and Ace Clean teamed up again to defeat Professor Grime, ACE’s newest mascot, who spreads germs. ACE distributed comic-book style posters that featured disease prevention tips and activities on the back to 25,000 students in the Washington, DC metropolitan area. ACE partnered with Arlington County City Schools where Ace Clean and Professor Grime visited ten elementary schools educating students on the correct method of handwashing and other healthy hygiene tips.